LOS ANGELES—After dashing off an indiscernible code on his laptop keyboard and sharply striking the enter key multiple times with his forefinger, a fast-talking, visibly tense computer hacker said that he just has to break through the encryption shield before he could upload the nano-virus, sources confirmed Tuesday. The efficiently executed hacking reportedly began at approximately 6:45 p.m. when Cipher, wearing a tight-fitting black hooded sweatshirt, skintight jeans, and black Converse with no laces, inserted a flash drive into his laptop’s USB port and said “Let the games begin” as an upload bar materialized on the screen. Sources confirmed that over the next few minutes, Cipher industriously navigated between multiple computer monitors displaying 3D-rendered images, criminal profiles, warehouse floor plans, and HTML code before brusquely swinging his chair around. “Amateurs,” he added under his breath. 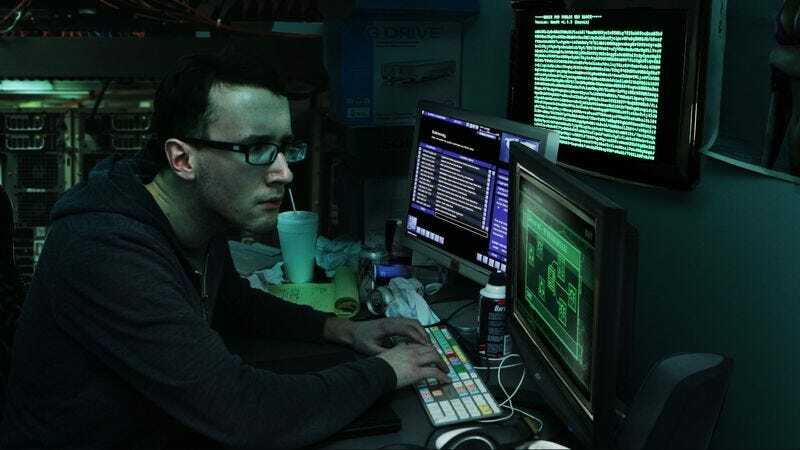 Reports indicate that after taking a swig from one of the six already opened Red Bulls on his desk, the visibly invigorated hacker quickly entered a series of memorized commands into the computer. After deactivating the encryption shield and gaining access to the remote server, sources confirmed that Cipher declared, “Now for the fun part,” and turned up the volume on a nearby stereo. As a heavy metal song blared from the speakers, the hacker reportedly leaned back in his seat, placed his hands behind his head, and waited for the nano-virus to transfer to the computer. At press time, sources confirmed this is why Cipher is the best in the business.